For those who are familiar with my World Champion Chauffeur back in QQLand, I now have a World Champion Taxi Driver in RamlyLand. It all happened with I was on a business trip to KL to visit a factory in the middle of nowhere. Well, smacked in the middle of the palm tree plantation. Getting there in the morning of Day 2 was the itinerary which got off with no hiccups as a kind colleague picked us up en route to work from Petaling Jaya. But it's when we proceeded to the next item in the itinerary (meetings back in PJ) was when it all went downhill. 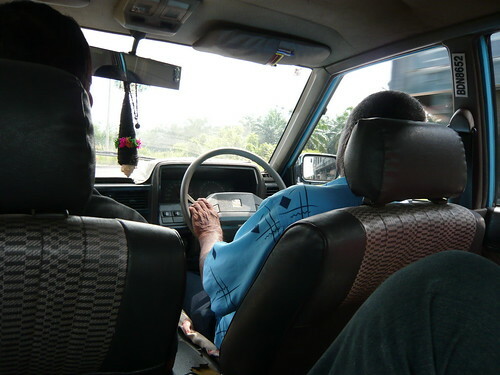 Our local colleagues booked a taxi for us to head back to PJ (90km away) and the following was the sequence of events. World Champion Taxi Driver blur f*cked. Forgot about the booking until we called him. World Champion Taxi Driver arrived 1 hour later. We couldn't get any other cabs in the interim as he is the ONLY cab available in the God-forsaken place. World Champion Taxi arrived with the windows all down. In other words, World Champion Taxi got no aircon. We hopped in the back of the car only to realised that World Champion Taxi got not seat belt at the back. We had to press down the lock button and sit closer to the middle coz World Champion Taxi door lever dangles freely and we wondered if the door will swing open halfway through the journey. As nervous as we are about the journey, we didn't hold on to the overhead grab bar of the World Champion Taxi. They were broken off and missing a long time ago. World Champion Taxi spluttered, hiccuped and jerked barely 500m away from the factory. World Champion Taxi got no petrol in its tank. World Champion Taxi Driver shrugged and smiled like an idiot saying that his petrol meter still shows 1/4 tank. Lucky for us, World Champion Taxi was on a mild down slope and we glided at 10 km/h per hour for a few kilometers under the scorching hot sun until we found a Shell Petrol Station. My colleague soaked his underwear from all the perspiration while waiting for the World Champion Taxi to glide into the petrol station. World Champion Taxi Driver pumped only about RM 20.00 worth of petrol which by my calculation, he will run out of petrol AGAIN after he drop us off. Which by then, is bor wa eh tai jee liao. i think every sequence of event, you just go WTF?!?! Gary: facepalm, slap forehead. you name it, i'd have probably done it.